The adult children of GOP nominee Donald Trump made headlines this past week by releasing a truly creepy ad aimed at Millennials. 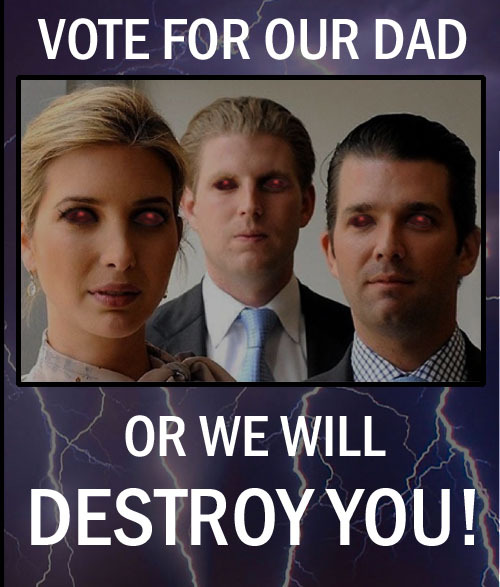 Ivanka, Eric and Donald Jr. looked eerily like some combination of the Children of the Corn, Invasion of the Body Snatchers and the Stepford Wives as they seem to be saying to their peers: Vote for our dad… or we will destroy you! It kind of makes us glad that we’re old coots here at the Bucket, and we’ll be kicking the bucket relatively soon. We’d hate to have to live in a world where these soulless husks of human flesh rule over humanity. At least they’ve got a future in horror movies. Donald Trump’s children, Ivanka, Eric and Donald Jr, have released a new ad that commands Millennials to vote for their dad or face the dire consequences. What happens when parents can’t control their delightful little urchins in a public restaurant and the wee ones run amok? Fun times, that’s what! This article is from our July 25, 2006 issue. Most of the patrons at the Bucky’s Burgers at Cactus Corners’ Blue Cactus Shopping Center were absolutely delighted by the antics of Layla Cooper’s six rowdy and rambunctious children last Monday evening. Cooper and her urchins invaded the fast food chain at around 6:00pm and stayed for a full hour charming the customers. Cashier Drew, upon hearing of Cooper’s upcoming visit, immediately requested the following Monday off. Hold onto your hats everyone. Conservative christian Republicans are upset at President Obama! Shocking right? Unaccompanied immigrant children have been crossing the border in record numbers this year and who’s fault is it according to the right wing christians? Obama’s of course, even though the surge is related to law to curb child trafficking passed in 2008 and signed into law by….George W. Bush. What should we do with all these children? Conservative christians have been screaming loudly about the only obvious solution…send the little varmints back. What a great christian attitude! That’s certainly what Jesus would have done…or at least Capitalist Jesus would have done it. Just let holier than thou Bill O’Reilly explain it to you. The new updated Jesus message on little urchins now reads ‘Let the Children Suffer’. 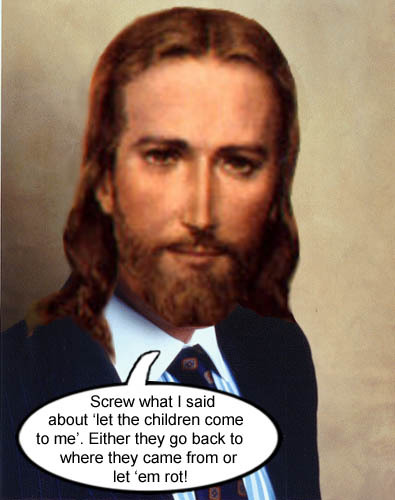 Capitalist Jesus, who is also very Republican, updates his message on little urchins to now say 'Let the children suffer'. Republican Presidential candidate Newt Gingrich has officially commenced the second destruction of his campaign just as polls showed him rising from the ashes from his first disintegration and leading the other GOP hopefuls in Con-a-thon 2012. 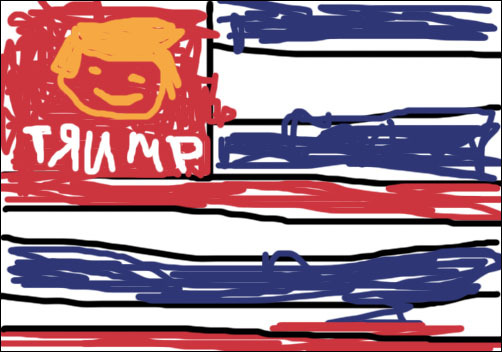 He recently was quoted as saying that the current child labor laws are stupid and that he would change them as soon as he could if he were President. Hey, we couldn’t agree more. We should return to those halcyon days of the 19th century when labor laws were lax and children were poor and hungry enough to work for a pittance or if they’re really industrious, a cup of gruel. The earlier a child, a.k.a worker drone, realizes that the only purpose for their existence is spending his or her life as an insignificant cog in the machinery of the Corporate States of America, the better off he or she will be. It’s compassionate conservatism, folks. Just accept it and don’t ask questions. Since Newtie has entered tin foil hat territory, we’re wondering who will be the next flavor of the month for the Republicans? Will it finally be Spiff Romney? (Not bloody likely!) Or will Ms. Ubetcha announce her candidacy after much reflection and encouragement from her Tea Party Patriots? This is better than a Mexican telenovela. Stay tuned America! 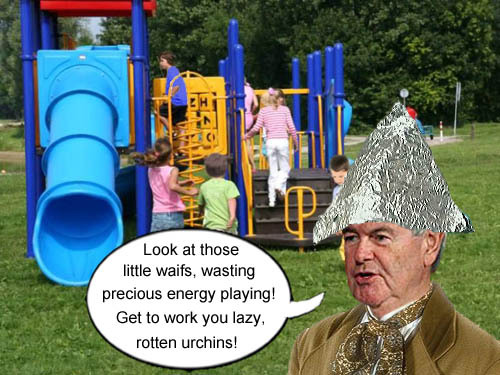 GOP candidate and 19th century aficionado, Newt Gingrich, has made the astute observation that children spend far too much time playing and should instead be preparing themselves for a life of corporate drudgery as a wage slave.